Freenet by the folks over at freenetproject is an anti-censorship and pro-freedom application and community which facilitates freedom of speech and free file sharing among users online their network. It is completely decentralized, putting it under the jurisdiction of no one authority. 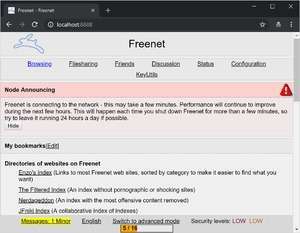 Freenet includes free chat forums, acts as a free web host accessible to others who are also online the Freenet network and also offers the option to function in "darknet" mode, making yourself only viewable to confirmed friends. The running of the program is actually rather difficult to detect and sharing is made possible by contributing to the network in the form of providing a small amount of your own hard drive space and bandwidth. Version 0.7.5.1484 is a freeware program which does not have restrictions and it's free so it doesn't cost anything. For security reasons, you should also check out the Freenet download at LO4D.com which includes virus and malware tests. Additional screenshots of this application download may be available, too. Freenet has a presence on social networks.